Oh, what a night: from left, “Jersey Boys” stars Matt Bogart, Joseph Leo Bwarie, Drew Gehling and Andy Karl meet with wheelchair athletes David Wagner, Andy Lapthorne, Lucas Sithole and Nick Taylor Tuesday at the August Wilson Theatre. Wagner and Taylor are the three-time Paralympic gold medalists from the U.S.
It’s no surprise the Motown sound inspires Azarenka, since the No. 2 seed has been dating Motown founder Berry Gordy’s son, LMFAO singer Redfoo, since at least last year’s tennis tourney. Redfoo, a.k.a. Stefan Kendal Gordy, even traveled Down Under to cheer on Vika earlier this year at the Australian Open. Word of Vika’s Tweet got us wondering whether other Open athletes were breaking for Broadway, and it turns out the distance between Flushing Meadows and Times Square is shorter than we thought. Russian pro Maria Sharapova, sidelined this year by a shoulder injury and with time on her hands, has taken in both “The Book of Mormon” and the just-closed “Vanya & Sonia &” -- wait for it! -- “Masha & Spike,” tennis insiders tell us. 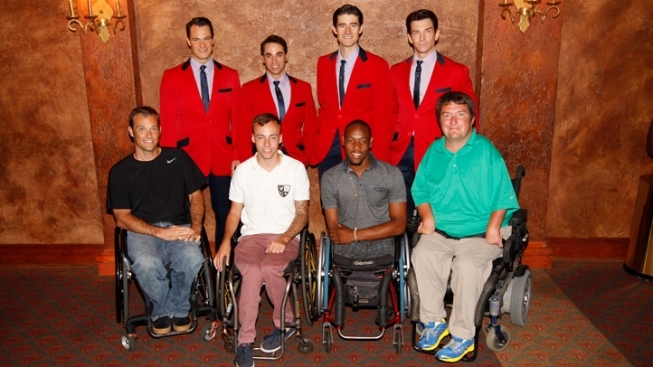 On Tuesday, some 20 of the world’s top wheelchair athletes made the trip to the August Wilson Theatre to enjoy “Jersey Boys,” meeting up with the musical’s stars afterward, all the better to be primed for the U.S. Open Wheelchair Tennis Competition, underway Thursday through Sunday. Soft-hearted Spaniard Rafa Nadal has acknowledged his love of musicals, telling reporters that he’s seen “The Phantom of the Opera” at least “six times” in the past. No word yet on his post tourney theater plans this year. And what did First Lady Michelle Obama do immediately after her appearance at the Aug. 24 Arthur Ashe Kids’ Day? She took Sasha and Malia to see “The Trip to Bountiful.” According to backstage spies, the trio slipped into their seats just as the first act was starting, and visited with Cicely Tyson, Vanessa Williams and Cuba Gooding Jr. right after curtain.